If you hit a pothole at a decent speed, your tires can suffer serious damage such as a tear or blowout. Your wheels can also be damaged, with bent rims being a common result of pothole hits. Responsible for keeping your vehicle stable, shocks absorb impact and then convert/dissipate the energy said impact creates. If you hit a pothole hard enough, the force can cause this component to break which will mean that your tires won’t maintain proper equilibrium and suffer uneven wear as a result, which negatively affects several aspects of your vehicle including its gas mileage. Your tires can also wear out unevenly in the event of vehicle misalignment, which pothole hits can cause. Without proper alignment, your risk of incurring a flat tire also increases greatly while your suspension can likewise be impacted. All of the components above are connected to your vehicle’s steering system so if they are damaged as the result of hitting a pothole, your steering will be affected. Not being able to properly control your vehicle is highly-problematic for obvious reasons, which is why you should always take your vehicle in for an inspection from ASE-certified technicians after you hit a pothole. 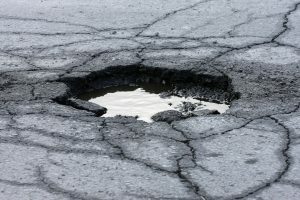 The immediate damage caused by potholes can indeed be significant but there can also be unseen/unnoticed damage that can lead to long-term problems for your vehicle. If you have any questions/concerns regarding your vehicle’s health, be sure to give us a call at 303-347-1010 – we’re dedicated to keeping drivers in Arapahoe County safely on the road year-round!